Toby Childs, a second year Development Practice Student, explored all the stars on the map above during the roughly two months between June 5th to August 12th, 2017. The heavy travel last summer, however, is just a microcosm of a professional life on the move, in a long search of how he can give back. Since graduating from Bates College in 2010, Toby knew that he “wanted to be living a global life for something that had [him] traveling or exploring”, which initially meant traveling abroad and teaching English. After living in Boston and San Francisco, he started teaching English in Thailand and then Middle School Art in Shanghai, China. This brought him into the global sphere, working and living abroad – learning how to engage with communities through different cultural differences. A major change happened when a friend of his, Petra Teslerova, brought Toby on board to help build a public health development program in Rwanda. He went back to San Francisco and used that as base to launch a nine-month fellowship with the organization, MAMA HOPE. The first three months of the fellowship was a crash course in the “MAMA HOPE philosophy of empowerment and partnership,” as well as fundraising. Toby was required to raise at least $20,000 for his partner organization. This meant organizing events, speaking at forums, asking individuals one-on-one, and email campaigns. “It was very tough, very challenging. About three quarters of the energy of those first three months was in that.” The work paid off, however, since he successful raised over $26,000 around the country, including San Francisco and Pittsburgh. The remaining energy went into a crash-course in international development, namely focusing on grassroots, community partnerships devoted to enabling and empowering “change makers that already exist within the community;” this is in contrast to the traditional view of a large, heavy-handed organization taking more directional roles in implementing change. It is about recognizing that people are more alike than different, “to stop the pity and unlock the potential” from the ground up. The message of the video is that people around the world are more alike than different and should view others for how they really are. 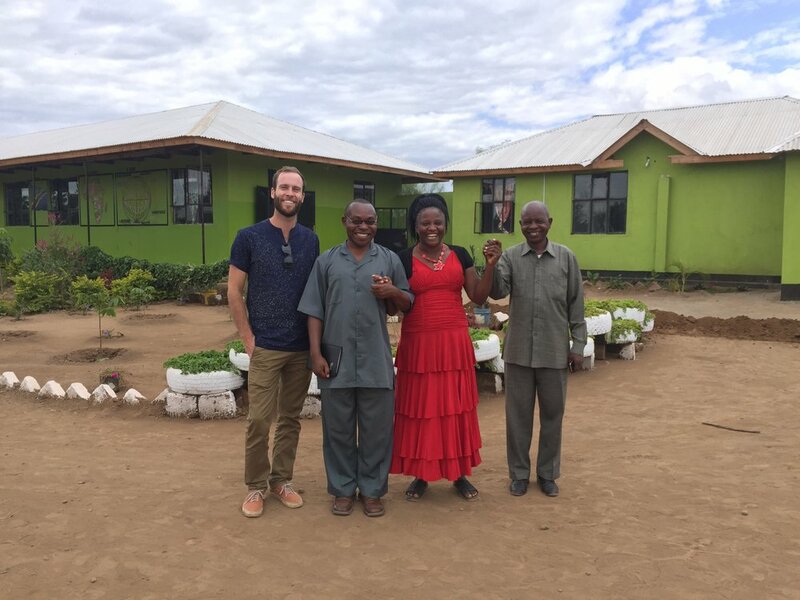 Toby revisits St. Timothy's School in Tanzania. This experience at MAMA HOPE compelled Toby to get a Masters in this field of work, Development Practice. He entered SIPA in 2016 and, as per their curriculum, had to take DP-Lab 1 and DP-Lab 2. In DP 1 he met Laura Budzyna, who runs the Monitoring and Evaluating (M&E) department at D-Lab, a development program at MIT. D-Lab partners with several non-profits around the world and, with these connections, Laura and Toby were able to compile a ‘laundry list’ of different ongoing projects Toby would be able to contribute to while in Africa. Arusha, Tanzania was next. He worked with a partner of D-Lab, Twende, which is an engineering hub. The giant open space did a lot of work in pedal power, including getting corn off the cob, milling techniques, washing machines, among others. Irrigation system prototypes are also under development. He was only in Arusha for only two days, so he spent most of the time training their new intern in M&E techniques. Then, it was Nairobi. He met up with Global Minimum and Foondi, two innovation education programs. He was there for four days providing M&E consulting for both programs as well as exploring other organizations working in design and engineering such at AB3D, a business building 3D printers for schools in East Africa. After Nirobi, he wanted to check up on the Rwanda program, which he and his friend were involved in before SIPA (pictured above). Training two new employees and running treatment and education program at two different schools, the 5 days were a great success in both programmatic action, but also in reconnecting with a community he has been working alongside to for over four years. After a relaxing five-days in Cape Town, going on “the most amazing hike of [his] life”, he headed off to Lusaka, Zambia, which would host him until the end of his trip. In Lusaka, he worked with another D-Lab partner, World Vision, following up on a Creative Capacity Building project they had implemented. Toby applied more of the M&E skills he learned in DP-Lab to make an impact assessment. “Honestly, the drudging and down parts almost overshadow the good parts in a way. This summer was a big lesson in knowing my limits as both a working professional in the field and as a traveler in general. I was basically for the first two months traveling non-stop. Every 2-5 days I was changing location, fully living out of a suitcase, which was a very exhausting lifestyle. One, because you are constantly on the move, and also because you have no community and no connection with people. I’m talking to people all day in these interviews, but when you are in an area for only 2-3 days, it is not like you have the opportunity to become friends with people. So I was very much alone. So some of the good parts was definitely getting in this scene of innovation. I’m not an engineer, I don’t know how to weld, I don’t know how to do all that work with metal or handle wood and whatnot. I’ve never seen that, so to get really in there and see what is begin done in East Africa was really, really cool. So that was awesome. A lot of the conversations I had with people throughout Uganda were super inspiriting. People that are creating second businesses with the skills that they learned, or approaching sales in these new ways because they are seeing all this opportunity now. There was a lot of inspiration which came out of that. This year, Toby is going to be learning more about data and data management. We will see how this next year shapes his future career, both from a skills and directional standpoint. We will have to wait and see where the winds take him.